A Ring Made To Last: Its strength Tungsten Carbide will not bent out-of-shape or crack like other metals, Perfect 8mm width, suitable for both Men and Women.If you need a solid, long-lasting ring, look no further. Elegance & Comfort:Weighty and Durable, excellent scratch resistant performance,Rounded smooth inner surface, it's comfortable to wear. 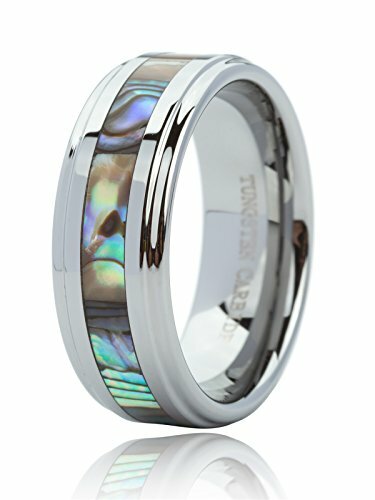 Strong & Durable:Tungsten Carbide will only scratch in very unique and extreme conditions, which means a polished Titanium wedding band ring will look as good in many years time as when you bought it. Satisfaction Guaranteed:You are protected by a 30 days no questions asked full money back guarantee. Your satisfaction is our goal.Thank you very much! Just Lsy jewelry box, save your gift wrap service fee, and help you store the ring much safer and longer. If you have any questions about this product by Just Lsy, contact us by completing and submitting the form below. If you are looking for a specif part number, please include it with your message.